Duong Dai Lam, professor at the Hanoi-based Military Culture and Arts College, has won first prizes at two classical music competitions in Poland and Russia. 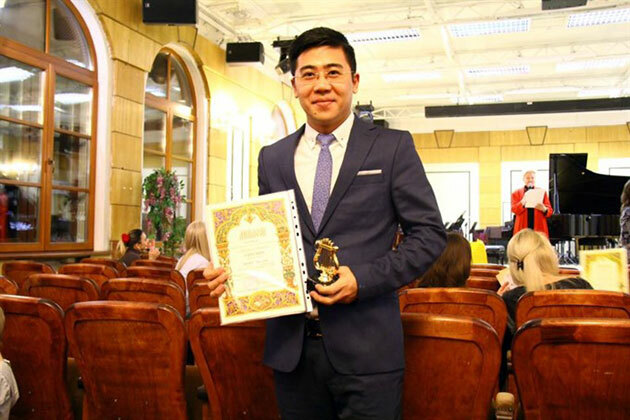 Lam studies vocal music at the prestigious Russian Gnessin Academy of Music, thanks to an exchange programme between his Vietnamese college and the academy. On April 10, he won first prize at the International Master Competition for Music Teachers in Warsaw (Poland). The competition, which runs from April 7 to April 10, attracted 34 music teachers from Poland, Russia, Czech Republic, Lithuania and Ukraine. The project is for school and music schools teachers of all degrees who have work experience in arts education. Lam won the first prize in the vocal category. Previously, in early April, he won first prize at 21st International Classical Music Festival, in Moscow (Russia), honouring Franz Schubert. The festival was held from March 28 to April 4 in Moscow and featured more than 200 entrants from Europe and Asia. Before winning those two international prizes, Lam won second prize at Tieng Hat Mua Thu (Autumn Singing Voice) contest in 2008 in Vietnam. “If musical talents in Vietnam are trained at young age, they will succeed in their musical career because they are hard working and intelligent,” said the 32-year-old teacher. “I’ve suggested my school in Hanoi send young professors to Russia for their studies. The excellent environment in Russia or in other advanced countries will help them develop better,” he added./.